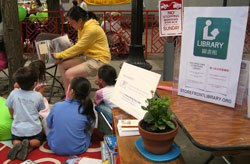 On Sunday, July 12, a mobile version of the Storefront Library Project made an appearance at the 2009 Chinatown Main Street Festival. Staff were on-hand to discuss the project, and elements of the Storefront Library program were demonstrated, such as a small children’s reading area, photography and calligraphy books for adult browsing, and free WIFI. A slideshow of the event is available in the Multimedia Player, at right. We’ll be appearing at other neighborhood events later this summer. The event was also a unique opportunity to observe and gather feedback from “library patrons” as they explored the books on hand and talked about their own ideas for what a library in Chinatown could include. We’ll be considering what we learned in the field as we continue working towards the launch of the Storefront Library this fall. Many thanks to Jen Wang for volunteering as a translator and reader. Also thanks to local publisher Cheng & Tsui for an early donation of bilingual children’s books which were put into service at the event.